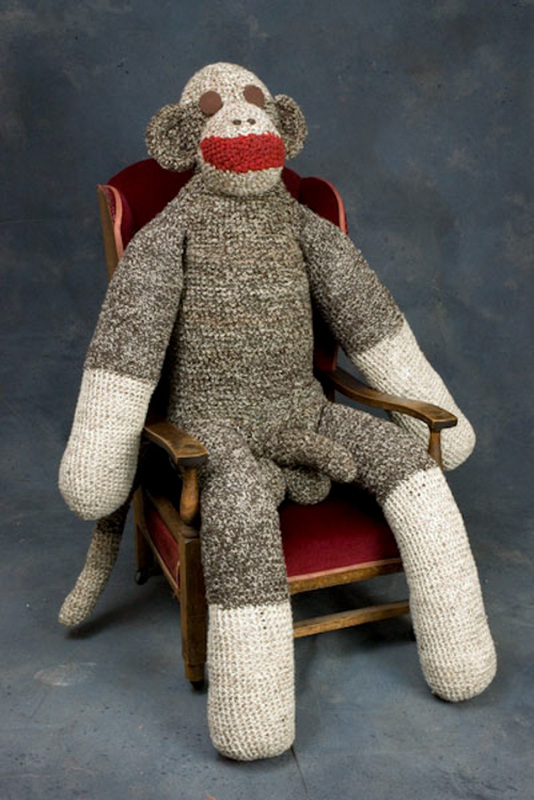 Over the years, I’ve crafted dozens of sock monkeys - always making sure that they were anatomically correct. Cute as they were, I dreamt of something bigger. Materials were a challenge, as there is no actual sock monkey fabric on the market. I purchased 16 woolen sweaters at Goodwill, ever mindful of desired colors. After the sweaters were machine washed and dried (on hot settings) I ripped each row of yarn, knotting my way along. When the balls of yarn were ready, I mixed and matched colors into three-ply. Here, the tedium ended and the fun began! Thank you, grandmother, for teaching me how to crochet! Hours of guilt-free TV watching commenced. Mr. Johnson was finished in less than a month!